Thank you so much Isis!...the pdf will be printed and but in my little book with patterns for embroidery. And your embroidery is coming along very nicely! Is the red band for the purse...as it is said to be in the text about the original? the red band is for garters for the same outfit. :) i'm working on a new superchic outfit for my rich persona. What date is the outfit based on and which veil are you choosing. i also want to make a silk birgitta coif for underneath. 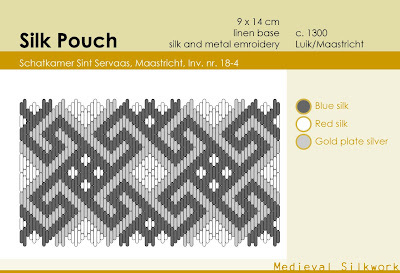 i decided having a c.1300 based purse wouldn't be a problem since embroidery was valuable and probably passed on from generation to generation. oh and i also want pattens with embossed leather showing a scene with tristan and isolde in the garden (a rather popular style in the low countries in the late 14th and 15th century). This is a lovely pattern! I'm putting it on my to-do list, thanks for the picture, too! And yes the outfit will cost you...what what a joy it will be to make it and wear it! Do you by any chance have a picture of the whole original purse or know where I might find one (internet/book? Thank you for such a great site. 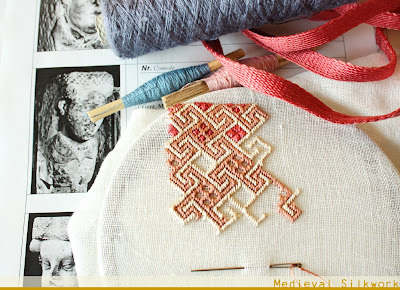 I'm more of a sewer than an embroiderer - but this site has inspired me enough to have a go! The post comparing silks was very helpful. I ordered some from Devere - really like it. One thing I found I thought I'd share: I found that the 1440 denier will split into two strands fairly easily and seems to be a better size than the 1200 for use on 50 count(per inch) linen. I have never done a embrioded pouch before, but now it's time. I love the pattern on this one, but before I order silk and fabric I have som questions I hope you can answer for me. The pattern says that the fabric was a linen base with 20/22 threads/cm. In sweden they only have 8, 10 or 12 threds/cm in the embroiderystores. Where can I find the right fabric? I have planned to order silk from Devere, but I have no idea of how much I need for a pouch? If I order 1200 denier silk from devere, is it filament silk or spun silk? hi linda! i have been lucky to find a linen similar to the one in the original in ikea. it was actually the fabric of ready made curtains. i bought them some years ago, so i fear they don't sell them any longer. i can't really give you other suggestions on where you can find the right linen. i have been really lucky with those ikea curtains. the denier 1200 from devere is filament silk, so that is exactly what you need for this pouch. when you go for a pouch of ca. 10x10 cm two 25m rolls of each color will me more than enough. you will probably even have enough left for the drawstrings. be sure to order some extra rolls for the tassels. i hope this helps, if you have more questions, please just ask! I'm also wondering where to get more information on this purse. I'm interested in recreating it for as an SCA Arts and Sciences competition entry, and would love more information. the only literature on this purse I know is Staufer, A. (1991), Die mittelalterlichen Textilien von St. Servatius in Maastricht, Bern: Abegg-Stiftung Riggisberg. It's a great book, but of course the information on each textile fragment in it is only about 1 page long. Hi. Wow - that embroidery is so pretty. You've inspired me to look into making some of my own. I was hoping to have a look at the PDF you link to but that page seem to have died. I even tried it on the wayback machine - but no go. Do you have a copy? i will try to upload it again. can't promise how soon that will be. i'm abroad at the moment and haven't got my external HD with me. next week i will attend a conference, so i'll try to get it done asap after that.